FROM IMAGE ENTERTAINMENT: STAND-UP AT IT'S BIGGEST AND BOLDEST! Chatsworth, CA - Prepare for a show that's unruly, untamed and uncensored! 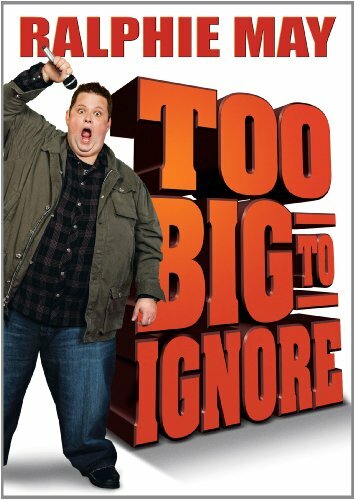 On May 1st, Image Entertainment releases an experiment in comedic chaos, Ralphie May: Too Big To Ignore: a merciless and a twisted take on the madness of our modern world. Featuring one the most unique voices in stand-up today, the larger than life, Ralphie May: Too Big to Ignore is Ralphie's record breaking 4th Comedy Central Special, and will be available on DVD for an SRP of $14.98. Pre-book is April 3rd. A finalist in "Last Comic Standing", voted one of Variety's '10 Comics to Watch.' Ralphie May has also appeared on "The Wayne Brady Show," "Jimmy Kimmel Live," "The Tonight Show with Jay Leno," and "Celebrity Fit Club." He has appeared at festivals including the South Beach and Las Vegas Comedy Festivals and also served as a host of Comedy Central's "LIVE AT GOTHAM." With influences that range from Buddy Hackett to Richard Pryor, May has become one of the most popular comics touring today. Known for a wild "hip-hop" brand of humor that skewers politics, race and even his own family, this is a no-holds-barred act, and has earned May a legion of diehard fans who a love his shock and guffaw technique. In Ralphie May: Too Big To Ignore the comic is at the top of his game, giving his most lively and outrageous performances yet. Ralphie May has sold out countless venues and won over audiences with his sly observations and bad boy delivery he has become one of the most unique voices in comedy today, and with Ralphie May: Too Big To Ignore, the comic proves he's still as large and lovable as ever. Image Entertainment, Inc. is a leading independent licensee and distributor of entertainment programming in North America, with approximately 3,700 exclusive DVD titles and approximately 300 exclusive CD titles in domestic release and more than 450 programs internationally via sublicense agreements. For many of its titles, the Company has exclusive audio and broadcast rights, as well as digital download rights to approximately 2,200 video programs and approximately 500 audio titles containing more than 5,700 individual tracks. The Company is headquartered in Chatsworth, California. For more information about Image Entertainment, Inc., please go to www.image-entertainment.com.